Sticky Trap Horsefly Traps are the world's leading flytraps! 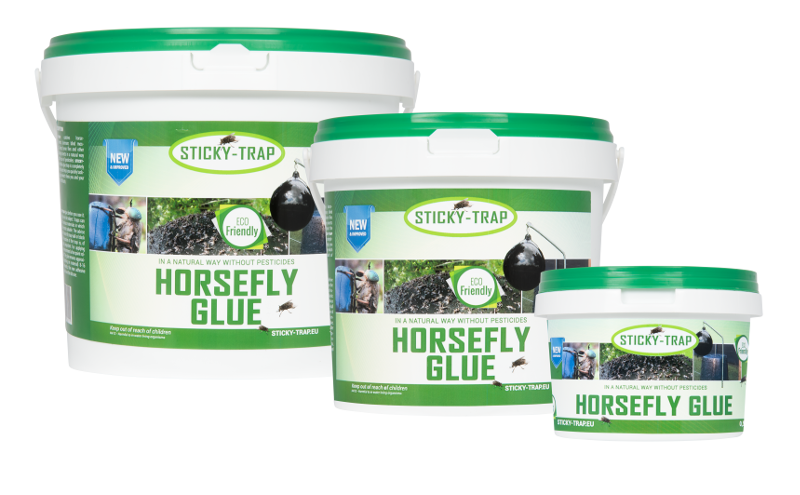 Sticky Trap Glue has been specially developed for catching horseflies, hornets, stable flies, and other biting insects around people and livestock. It is eco-friendly, water resistant, pesticide-free and completely safe to use! The Sticky Trap Black ball makes the perfect trap and is designed specifically for catching horseflies, botflies and other biting insects, which hunt for heat and movement. The ball is made from black rubber and has a diameter of 60cm. How does the Sticky Trap glue trap work? The horsefly is an insect which uses blood to procreate and to make eggs. The female horsefly searches for her prey using infrared eyes and while she is flying, she is scanning the environment for heat sources. Everything which is warm and moves, in her eyes, contains blood and is a potential prey to bite. With a razor-sharp beak, the horsefly cuts open the skin and starts to drink the blood. 1. The horsefly trap is a black, moving ball which is heated by the sun. 2. The horsefly sees this as prey and lands on the ball to bite it. 3. The Sticky Trap glue on the ball traps the horsefly on landing. 1. The ball needs to hang in a sunny, windy spot around you or the animals. 2. Apply a thin layer of Sticky Trap glue (1-2 mm thick) with a brush to the outside of the ball. The horsefly glue sticks for 8-22 weeks and can be applied loosely with a brush. You can apply new glue over the old one - 1.5L of horsefly glue will cover a 60cm ball 6 times. Cleaning the ball can be done simply with a spatula and it may help to roll the ball in sand or dirt first. Use in combination with the Sticky Trap Pole (145 cm) to hang the trap in every location from your yard to your garden. For the longest lifespan, we advise to store the Sticky Trap glue trap in a dry and frost-free environment.